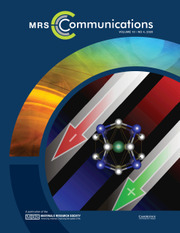 MRS Communications is a full-color, high-impact journal focused on rapid publication of completed research with broad appeal to the materials community. MRS Communications offers a rapid but rigorous peer-review process and time to publication. Leveraging its access to the far-reaching technical expertise of MRS members and leading materials researchers from around the world, the journal boasts an experienced and highly respected board of principal editors and reviewers. We are delighted to announce to Clara Santato, Polytechnique Montréal, has been awarded the 2018 MRS Communications Lecture. Watch a video of the award winning paper. To purchase print-on-demand copies of MRS Communications, please follow this link. Purchase of print-on-demand copies is handled and fulfilled directly through Sheridan Custom Publishing*.